Nobody loves to scrub dirty and greasy oven in the limited free time, except us! We specialised in oven cleaning services and we would like to welcome all the residents of Raynes Park to give us a try. We take pride in our leading position on the market, which we back up every time, when we clean. The oven is one of the most used kitchen appliance for the cooking of the food. It’s sanitation is of major importance for its efficiency and the quality of your food. All the dried leftovers are not only dangerous for the health, but also may cause the set of a fire. Rely on our expertise and avoid any troubles. We realise that you spend a fortune on your oven, but you can fully trust in our unrivalled knowledge. Thanks to the long years of work, we enriched our competence and now we even guarantee for the perfect, scratch-free cleaning. We collaborate with highly-qualified and hard-working cleaning techs, who know the right approach to sanitise every nook, leaving the kitchen appliance ready for use. We deliver all the cleaning materials and detergents. Since it is directly related to your food, we always utilise only toxin-free detergents. It is a matter of fact that the ovens get dirty, no matter how hard you try to avoid this. That’s why to sanitise them, means that you protect your investment, home and health. We all know the bad experience of cleaning dried oven all day, putting every effort in this and at last the result is not very encouraging. Leave this cleaning duty to our experts and extend the life of the kitchen appliance with our help. Our cleaning techs are specially trained exactly in this field, so that they will treat your oven with special care. They will assemble the oven in order to reach every nook and to sanitise its trays and racks. At last they will polish the oven, so it will look like you just bought it, ready for the new cooking challenges. The oven, covered with black grime is unsightly view. 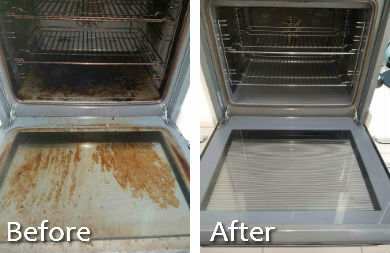 Change this with the help of our oven cleaning services, which are available in Raynes Park. We charge very moderately, because our main goal is to provide safe environment for preparing of your food. Give us a call and our approachable representatives will schedule an appointment in a convenient time for you. Don’t allow the grime on your oven to win the battle!